For me, when you find a review easy to type up you know it's a good album. I found this with this stunning John Nicholas release. It might only be 5 tracks longs, but each track is well worth its money. Read More For me, when you find a review easy to type up you know it's a good album. I found this with this stunning John Nicholas release. It might only be 5 tracks longs, but each track is well worth its money. 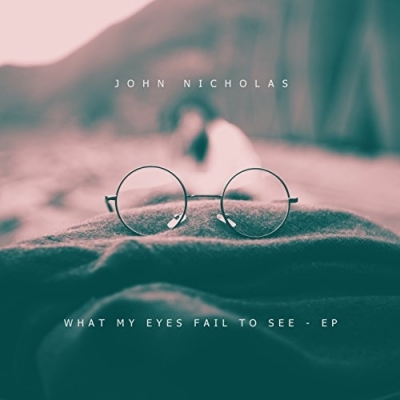 Off the back of two highly successful UK tours, UK Christian singer/songwriter John Nicholas has returned with a new EP 'What My Eyes Fail To See'. With inspiration taken from the likes of Foy Vance and John Mayer, John’s songs are catchy, relatable, and envelope the listener through a web of textures he creates with his loop pedal. John’s previous releases ‘Runaway’ and ‘What Love Is’ have been playlisted across the UK on stations. 'No Man Is An Island' is as you might expect about a man who is trying to do everything is his own strength. From ballads to atmospheric pop this album is strong in identity. There are elements of musical inspiration from artist like Ed Sheeran in the opening songs 'Run Away' and 'What Love Is' and this gives the EP the up to date sound. We hear the gritty and actually tender vocals of John Nicholas in the song 'I Care' but the beauty of closing track 'Rely' is truly something else. It's breathtaking. The songs is about not not relying on ourselves (which is a strong theme on this EP), but relying on God. That's what I got out of it. I am really impressed with this EP. I listen to so much music, sometimes albums come and go, but can sound the same. This EP has much more depth that that and I highly recommend checking out 'What My Eyes Fail To See' as soon as you can.